As part of the Regency Space Solutions' wire shelving collection, this 18" x 48" chrome wire shelf is great for use in dry storage and heated environments. It's made of a durable, chrome plated metal, with a clear epoxy coating. Plus, its high-quality design is commercial grade and delivers the reliable performance every business expects and needs. If I had my way my entire restaurant would be lined with these shelves. They provide so much additional reliable storage. Easy to put together and easy to clean. Love it! I live in a studio apt and was the prefect size to make a breakfast bar using the shorter posts - separates my kitchen and living area, and provides storage below! We appreciate your review, Reid. We wish this Regency 18 inch x 48 inch NSF Chrome Wire Shelf would have worked out for you. Our Customer Solutions team will remain in contact with you about this. Very happy with all my Regency shelving purchases. I got these to add more shelves on an existing Metro unit I already had. I missed the warning that while you can mix and match brands, same components have to be same brand- definitely heed this warning to make your life easier. We got the shelves on, but it wasn't easy! Bought a couple of these individual shelves to add to a kit that I'd already purchased elsewhere. These shelves seem a lot more sturdy than the ones I'd already bought - the bars run the opposite direction which seems to help a lot. We bought several of these shelves for our pantry. We are able to put lots of weight on these shelves without worrying about the shelf falling over. We are very happy with the purchase. Have been using the Regency NSF Chrome products for a while. The shelves and the poles. The shelves are very sturdy and the plastic clips that hold them on the poles form a good grip. As long as you lock them in place, you will have no issues with movement. They can hold quite a bit of weight, we have never put more than 300 pounds on them. We have our entire garage, pantry, and storage room in the chrome wire shelves now and love them. I love the adjustability, and accessories and having them on casters/wheels. It is nice to have everything so neat and organized. Excellent shelves , great value at a great price , we have a lot of these in the kitchen and we love them they look nice and clean . 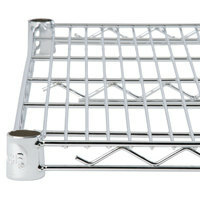 The 18" by 48" NSF Chrome Wire Shelf is a good addition to shelving units of the same size. It also works well with shorter posts in creating display stands. These are very heavy duty and look great in our restaurant kitchen. We mounted them high with the separate purchased mounting brackets to store supplies. All around great shelf for any room of the house or restaurant . I have regency shelving in my laundry room , garage , kitchen , and workshop. Heavy duty built to last and great looking also. I'm using the 18x48 to display my kids R.C. cars/trucks. Bought a couple of these shelves to extend the Shelf kits we also purchased here. The chrome wire holds up pretty well - we are in the tropics so rust was inevitable but with normal cleaning/upkeep all our shelves still look great - even after 2 years. The Regency 18" x 48" NSF Chrome Wire Shelf is a strong sturdy shelf that makes storage easy. The adjustable shelves help to allow us to utilize all of our space. We bought several Regency shelving units lately. We used to get the other ones. there is no major difference these perform great and are a great value! very sturdy rack. It is not the heaviest duty rack you can get it. but for daily kitchen work it is great. I would get it again. We can get over 70 bars of soap on one shelf! Which allows us to make and dry over 800 bars a week. Wonderful to start with, but will be very easy to expand! Trusted brand of wire shelves that we've been using for years and hasn't failed us in any capacity. You can customize these in a number of ways and you can create more shelf space in your kitchen to use as you wish. We needed extra racks for our shelving unit and these fit perfectly. I used them to create an "L" in the corner adding on to our existing Regency shelving by attaching the Regency "S" hooks on both ends. Works and looks great, super sturdy. Buy this level of the shelf, since it needed more space to store, it is very easy to assemble to the rack, in 5 minutes you are ready to use it. Cheaper than the metro shelves but there is a price to pay for that. Setting up the shelves are a lot harder than metro. After building the shelves, it turned out that the poles were not completely linear with the ground. So one corner might be slightly higher than another. Some of the shelves are definitely harder to put on than others, takes about twice the time to build than metro and is even harder to adjust. The numbers on the shelves are also not as visible. However, for the price I would still get Regency over Metro. In the end it does what I need. Some of the best kitchen racks I've come across as far as appearance and durability. These same racks I use both in commercial kitchen and home kitchen. Helps create more shelf space and makes things easily accessible. These are so necessary for kitchens and bars. Not just for food, but we used this one to store all of our wine bottles on it. These chrome plated wire shelves are fantastic. They do everything you could imagine, and then some. I fell so deep in love with mine that I'm now in a relationship with it. Wish us luck! These are great for storage. We store many different items on them, Nothing falls through, things are easily seen, they do not bow when heavy items are sitting on them! I bought an extra couple of shelves when i bought the kit and wouldn't change a thing! They clean up nicely and they are very sturdy. I use these both at home and at my restaurant. Super sturdy shelfs. Love that these hold a lot of weight, sometimes hard to put together. Good product. These shelves help us keep our kitchen organized and clean. They mount to the wall easily and are strong and supportive. We have been happy with our purchase so far. These are the best shelves ever! Not only are they extremely sturdy but easy to put up as well. You can't beat the price either for such a quality product. My kitchen is very happy. This very easy to set up shelf saved us a great deal of grief in our kitchen. I bought this because I was short on cabinet space in our kitchen for pots and pans. It has done a great job at adding additional vertical storage space. It is sturdy enough to hold an assortment of cooking tools including cast iron pans (which I have hanging from hooks). The wheels additionally make moving it around the kitchen, if needed, very easy. I bought a bunch of these Regency 18" shelves from Webstaurant and have not been disappointed. They are a quality product at a great price. These shelves were easy to assemble and were able to hold all of my bbq catering equipment. The chrome appearance provides the overall classy look I was hoping to achieve. I will definitely order more of these as my business expands. We prefer the look of the chrome finish on these shelves for the retail section of our bakery. Easy to assemble and smart looking, we use these for everyday use. I cannot even count how many of these shelves we have in our facility. I have been using these for a countless amount of years and love them. They are strong and sturdy. The only downfall is the black plastic "sleeves" (sold separately) sometimes break. However, I use these shelves for everything. these shelves are great! The are super heavy duty and easy to setup and adjust shelves. This is all we use the the restaurnat my wife manages, and I even have a few sets at home for heavy storage. By far Regency shelving is the best value for your dollar. The quality is great and the price is right. The products hold up very well to consistent use. These shelving units are great for dry storage. a very convenient and affordable storage solution. every kitchen has some of these shelves but regency makes some really affordable options.